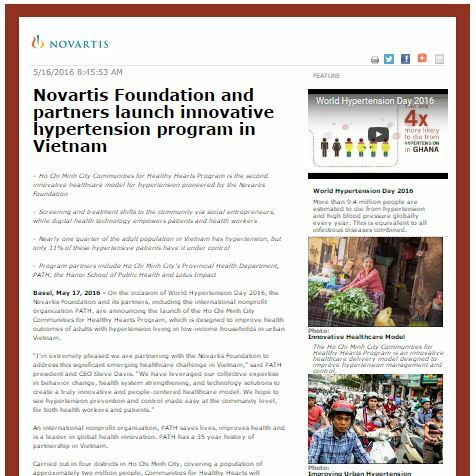 Basel, May 17, 2016 - On the occasion of World Hypertension Day 2016, the Novartis Foundation and its partners, including the international nonprofit organization PATH, are announcing the launch of the Ho Chi Minh City Communities for Healthy Hearts Program, which is designed to improve health outcomes of adults with hypertension living in low-income households in urban Vietnam. "I'm extremely pleased we are partnering with the Novartis Foundation to address this significant emerging healthcare challenge in Vietnam," said PATH president and CEO Steve Davis. "We have leveraged our collective expertise in behavior change, health system strengthening, and technology solutions to create a truly innovative and people-centered healthcare model. We hope to see hypertension prevention and control made easy at the community level, for both health workers and patients." An international nonprofit organization, PATH saves lives, improves health and is a leader in global health innovation. PATH has a 35 year history of partnership in Vietnam. Carried out in four districts in Ho Chi Minh City, covering a population of approximately two million people, Communities for Healthy Hearts will leverage new approaches to hypertension management by introducing social entrepreneurs to increase access points for cardiovascular health education and screening services. Additionally, the public and private health sectors will collaborate closely in this patient-centered approach to strengthen treatment and referral services. Digital health technology will empower patients in self-management and increase patient-to-provider contact. Learnings from this program will be evaluated to inform expansion of hypertension control efforts in Vietnam. "We are excited to see our hypertension work extend to Vietnam through an innovative collaborative approach," said Ann Aerts, Head of the Novartis Foundation. "As with our Community-based Hypertension Improvement Program (ComHIP) in Ghana, we hope to bring hypertension prevention and detection closer to patients to improve health outcomes and blood pressure control levels in urban settings in a way that is sustainable at scale." World Hypertension Day brings hypertension care and management into focus; complications from hypertension and high blood pressure account for 9.4 million deaths worldwide every year, this is equivalent to all infectious diseases combined. Nearly 25% of the adult population in Vietnam has hypertension, but less than half of them are aware of their condition. Of those diagnosed with hypertension, only 11% have it under control. In urban areas of Vietnam the prevalence of hypertension is higher at 33%, with Ho Chi Minh City being home to the largest urban population in the country. The Novartis Foundation is collaborating on Communities for Healthy Hearts with the Ho Chi Minh City's Provincial Health Department, PATH, the Hanoi School of Public Health, and Lotus Impact. This press release contains expressed or implied forward-looking statements, including statements that can be identified by terminology such as "launch," "designed," "emerging," "hope," "will," "efforts," "excited," or similar expressions. Such forward-looking statements reflect the current views of the Group regarding future events, and involve known and unknown risks, uncertainties and other factors that may cause actual results to be materially different from any future results expressed or implied by such statements. These expectations could be affected by, among other things, risks and factors referred to in the Risk Factors section of Novartis AG's current Form 20-F on file with the US Securities and Exchange Commission. Novartis is providing the information in this press release as of this date and does not undertake any obligation to update it in the future. The Novartis Foundation is a philanthropic organization pioneering innovative healthcare models that can have a transformational impact on the health of the poorest populations. We work hand-in-hand with our local and global partners to catalyze scalable and sustainable healthcare models to improve access and health outcomes, and to accelerate efforts to eliminate leprosy and malaria by focusing on interventions that aim to interrupt transmission. Everything we do is grounded in evidence and innovation, and our work is a continuous cycle of evaluation, adaptation and application. In 2015, the operational budget for the foundation was CHF 12 million and our programs reached 4.5 million people. Lim, SS, Vos, T, Flaxman, AD et al. A comparative risk assessment of burden of disease and injury attributable to 67 risk factors and risk factor clusters in 21 regions, 1990-2010: a systematic analysis for the Global Burden of Disease Study 2010. Lancet. 2012; 380: 2224-2260. Pham, S. Hypertension in Vietnam: From community-based studies to a national targeted programme. Epidemiology and Global Health. Department of Public Health and Clinical Medicine. Umeå University, Sweden, and Vietnam National Heart Institute, Bach Mai Hospital & Hanoi Medical University. Umeå, Sweden: Umeå University; 2012. Son et al, 2012. Prevalence, awareness, treatment and control of hypertension in Vietnam - results from a national survey. Journal of Human Hypertension.